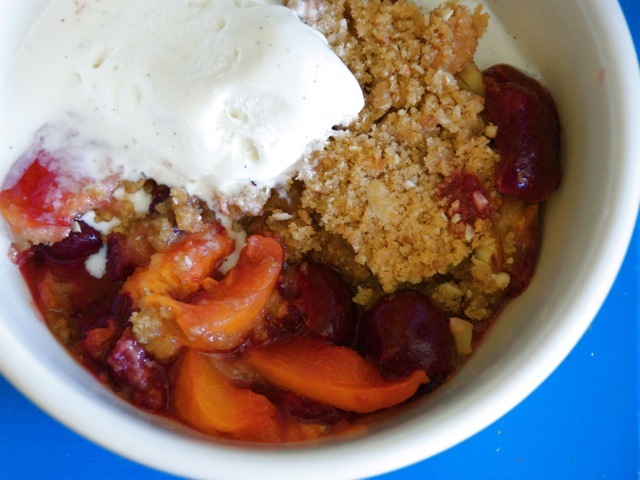 Apricots and cherries lead the stone-fruit season, and together they make a winning combination, especially paired in old-fashioned desserts like pie, crisp, cobbler, or crumble. If sour pie cherries are available, include a cup for their flavor. And, if raspberry season should coincide, you can’t go wrong throwing in a handful or two of those as well. Preheat the oven to 375 degrees. Lightly butter a 2½-quart gratin dish. Pit the apricots and cherries, then toss them with the sugar, tapioca, and almond extract. Lay the fruit into the prepared dish. Using your fingers or the paddle attachment of a mixer, make the topping. Combine the topping ingredients and work in the butter until the texture is coarse and crumbly. Pat it over the fruit. Set the dish on a baking pan to catch juices that might overflow, and bake until the top is browned and the juices have thickened around the edge, about 45 minutes. Serve warm with vanilla or honey ice cream. Be sure to read Deborah Madison's column on the wonder of cherries.